A MAJOR disparity in the number of children identified as being at risk of abuse or neglect on either side of the Irish border has prompted concerns from government appointed watchdogs. Official statistics obtained from government agencies show that proportionately four times as many children are monitored by child protection services in Northern Ireland as in the Republic of Ireland. 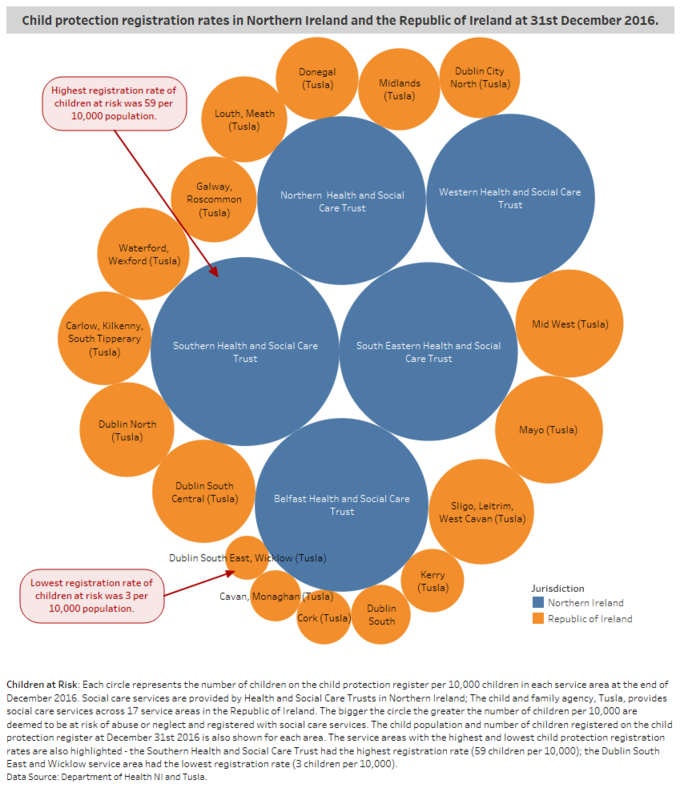 This comes as further findings reveal gaps in the number of social workers available to support children and families, with three times as many per head of population in the north than the south. The new findings have prompted questions over the adequacy of resources in the republic and whether vulnerable children are slipping through the net. Children are recorded on a child protection register where there is an ongoing risk of "significant harm" to a child because of concerns of abuse or neglect. In the north, 49 in every 10,000 children were identified as being at risk and monitored on a child protection register between December 2014 and December 2016. Over the same time period, 12 out of every 10,000 children in the south were assessed as being at risk and placed on the child protection register. This is despite a much higher number of initial child protection referrals in the south. Click here for more information on the number of children at risk of abuse or neglect in Northern Ireland and the Republic of Ireland over the past two years. The figures come as the republic’s record on child protection has come into sharp focus in the wake of foster care controversies, the handling of false child abuse allegations against a whistleblower, and the dark legacy of mother and baby homes, all of which are the subject of investigations or inquiries. Commenting on the figures, the Ombudsman for Children said the “stark contrast” between both jurisdictions warrants explanation. “It’s a big gap. The ratio of four to one in the numbers of children on the child register in the north compared to the south is unusual,” Dr Niall Muldoon told The Detail. The Commissioner for Children and Younger People in Northern Ireland Koulla Yiasouma said: “What I do strongly believe the figures don’t say is that we have higher levels of child abuse in Northern Ireland. What I think they say is that our system is more mature and therefore responding to children and young people”. Figures from the fourth quarter of 2016 suggest the gap has widened even further – rising to an almost five-fold difference in the child protection registration rate across both jurisdictions. As of December 31 there were 2,206 children on the child protection register in Northern Ireland and 1,272 children on an equivalent register in the republic. 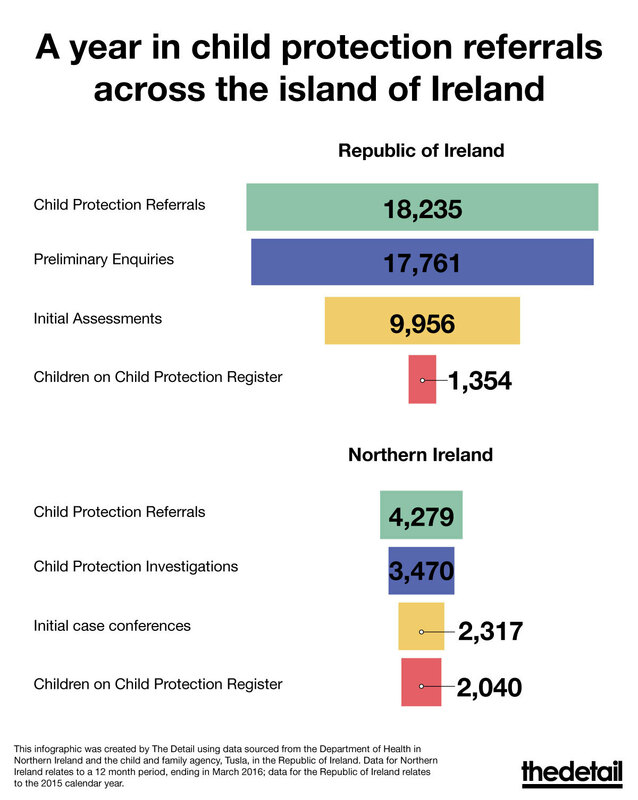 Taking population into account, this means that for every 10,000 children there were 51 on the child protection register in the north compared to 11 in the south. The graphic below further illustrates the significant variation in the number and rate of children at risk across both jurisdictions. Click on the following links to view the interactive version of this graphic on desktop, mobile or tablet devices. Government departments and agencies on both sides of the border declined to comment on the gap in child protection registration rates. Stormont's Department of Health said it was “unable to comment” on the numbers of children on the child protection register or legislation, policies or procedures in the republic. A spokesperson for the Children's Minister in the republic said: " The Minister does not intend to comment on this aspect as the child protection system in Northern Ireland is framed in a different legislative environment, with regulations and administrative arrangements which are not directly comparable to this jurisdiction." The child and family agency in the republic, Tusla, also said the systems were different in both jurisdictions and that comparison would “not provide accurate insights”. Experts, north and south, however, said that while there are some differences, child protection services in both jurisdictions are more similar than not. Child protection services in the north are provided by five Health and Social Care Trusts operated under the Health and Social Care Board. In the south, child protection services are provided by a dedicated child and family agency, Tusla, established in 2014. The child protection register provides an indication of the number of children at risk of physical, sexual, or emotional abuse or neglect; it is not, however, a register of abused or neglected children. For every child on the register, the National Society for the Prevention of Cruelty to Children (NSPCC) in Northern Ireland said there is a further eight children at risk who are not known to services. Child protection concerns come from a wide variety of sources, including social workers, teachers, doctors, nurses, police officers, relatives, neighbours and members of the public. In both jurisdictions each referral is assessed according to a ‘threshold of need’ to determine the extent of the risk of harm and the appropriate response. Where a risk of abuse or neglect is identified a child protection plan is drawn up by social care services to engage with the child and their family or guardians and link in with other relevant support services. Click here for an example of a child protection case in the Republic of Ireland and here for an example of a child protection case in Northern Ireland. While there are some differences in how child and family services operate, experts, north and south, say child protection services in both jurisdictions have more in common than not. “The legislation in the Republic of Ireland and Northern Ireland is broadly similar but there are some differences. However, once children are at a stage where they are registered on the child protection register they are probably children that are very similar rather than different,” Dr John Devaney, a senior lecturer at the School of Social Sciences, Education and Social Work, Queens University Belfast, told The Detail. On the variation in the number of children at risk across both jurisdictions, Dr Devaney said: “Two countries are not so dissimilar that you would expect there to be a vast difference. “In both jurisdictions, once a child is on the child protection register, there is a very formalised, structured approach to how organisations share their information and use that information to plan together and provide support to the child and help their parents address the difficulties they are experiencing,” he added. According to the Director of the Children's Research Centre in Trinity College Dublin, Professor Trevor Spratt, the jurisdictions are culturally similar but may differ in how services are delivered. “Culturally there’s not a big difference between the two jurisdictions but there will be differences in the social care services north and south. In the north there is a well-developed health and social care services system in place; in the south the state system is not as well developed or integrated, although there has been significant progress in this direction since the introduction of Tusla in 2014,” he said. Professor Spratt is unaware of any significant differences in the thresholds applied in child protection cases, i.e. the criteria used to decide if a child is at risk of neglect or emotional, physical, or sexual abuse. 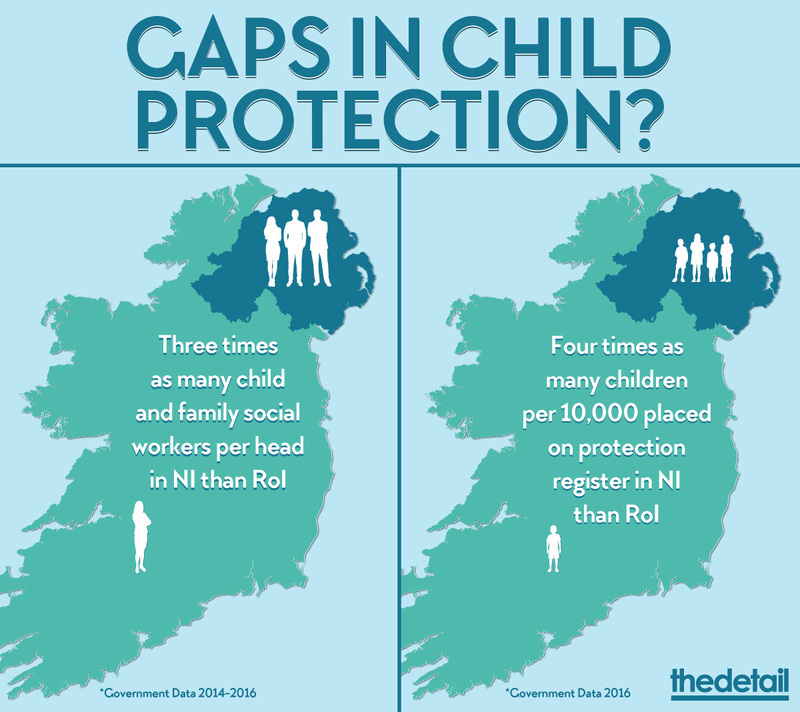 The data analysed by The Detail shows that while fewer children are placed on the child protection register in the south than in the north, there are more child protection referrals to social care services in the republic. In a report to the United Nations in October 2015 the Irish government accepted that the number of children on the child protection register was “relatively low” compared to the number of referrals to social services. In the south 159 child protection referrals were made for every 10,000 children in 2015; in the north the equivalent figure was 93 referrals for every 10,000 children. Such divergence in the rate of referrals may point to differences in how child protection concerns are processed in each jurisdiction. The graphic below illustrates the number of abuse and neglect referrals dealt with by child and family services in both jurisdictions and how they were processed in 2015. The source of referrals also points to further differences in the process. Around half of child protection referrals in the north come from social services. In the south almost as many child protection and welfare referrals come from the police force (20%) than from health and social care services (23%). The Children’s Ombudsman Dr Muldoon said the referral rate from police suggested the system may be responding too late. “This to me suggests we are not reaching vulnerable children at the right stage; that we are not intervening early enough. It means there has been some criminal or serious concern that has gone to Gardaí before being picked up by social care services. It’s not the most appropriate way to intervene where a child is vulnerable or at risk,” Dr Muldoon said. “My office has consistently said that Tusla has to be seen as a family support service as well as a child protection service. It has to move from being a crisis management agency dealing with cases of abuse or neglect to one that can intervene earlier and prevent abuse or neglect,” he added. “We need greater focus and investment in earlier intervention. There should be intervention and support from the time a mother is pregnant right up until that child reaches adulthood,” Dr Muldoon concluded. The Department of Children in the republic confirmed that it has commissioned a report examining the profile of children on the protection register, which will inform future policy. Children's Minister Katherine Zappone, however, said she was not aware of any issues around the child protection register and criteria used to determine abuse and neglect risk. “HIQA (Health and Information Quality Authority) has not reported an issue with the current set of thresholds to the Minister, which is within its remit,” a spokesperson for Minister Zappone said. The Minister for Children further stated that service providers were held to account by "a robust framework of standards and regulations". Read the full reponse from the Minister for Children Katherine Zappone here. Meanwhile the NI Commissioner for Children said there was no room for complacency in the north. “We can’t be complacent just because we seem to have a system that’s better able to respond to children and young people’s needs; that doesn’t mean we’ve got it cracked,” Commissioner Yiasouma said. Click here to read The Detail's story on the gap in staffing numbers and the pressures facing child and family services in both jurisdictions. The interactive graphic below further illustrates the significant variation in the number of children at risk across both jurisdictions. Click on the following links to view the interactive graphic on mobile or tablet devices.